I posted this photo on the blog! 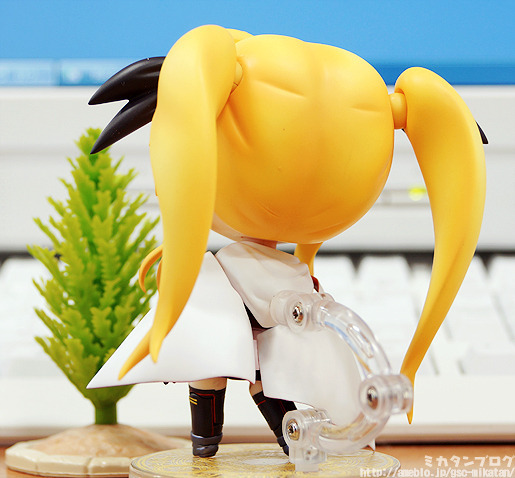 The thing is… this prototype was actually never put on display at WonFes! But now four months later she can finally have her debut on the blog!! 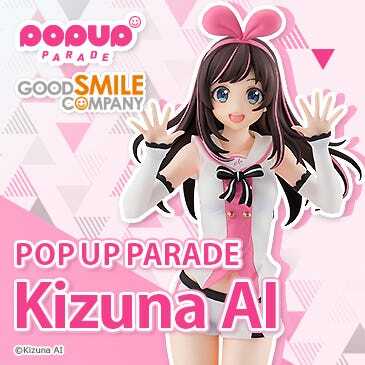 She has really come out looking absolutely adorable, so I think fans will really be able to look forward to this one! 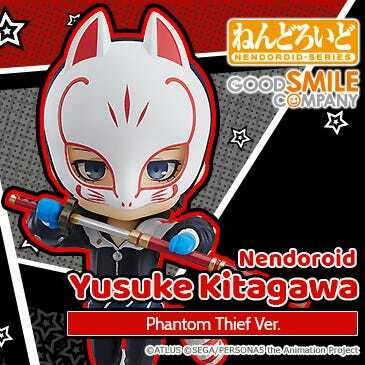 Nendoroid Fate Testarossa: Blaze Form Edition! 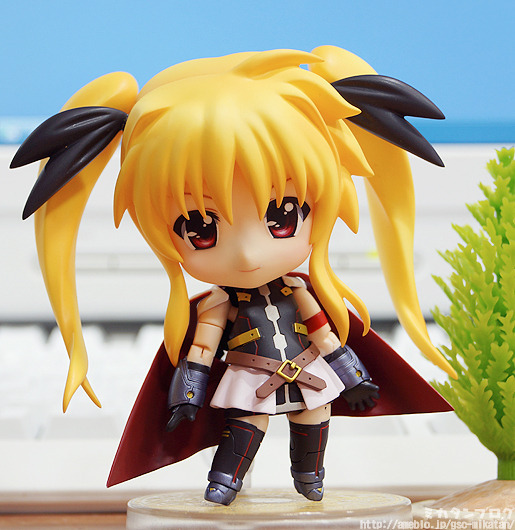 From the popular ‘Magical Girl Lyrical Nanoha The MOVIE 2nd A’s’ comes a fully posable Nendoroid of Fate Testarossa! 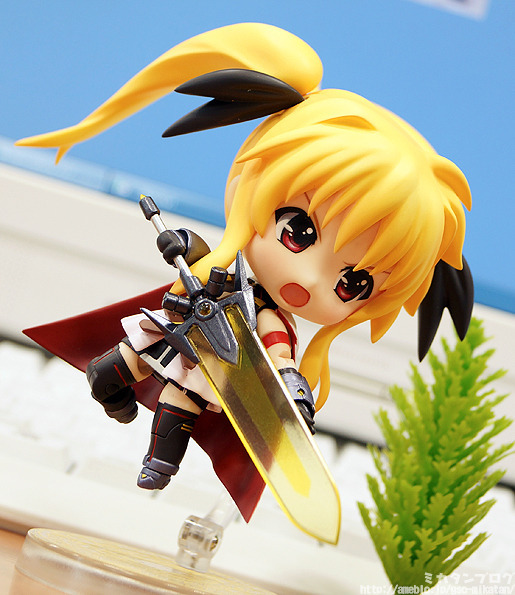 Be sure to display her together with the previously announced Nanoha Takamachi to recreate various battle scenes! 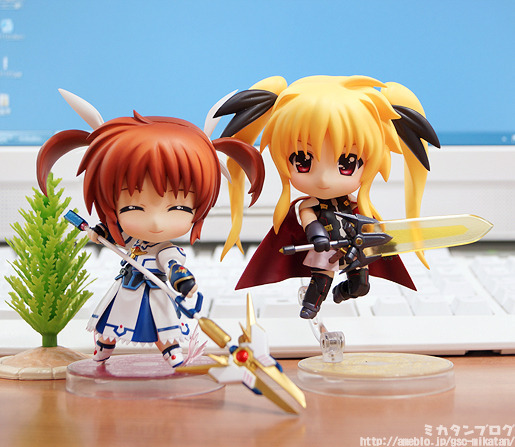 The Nanoha series is well-known for its gorgeous and flashy action in battle scenes, and with the fully posable Nendoroids you can recreate all your favorite scenes perfectly – just in Nendoroid size! 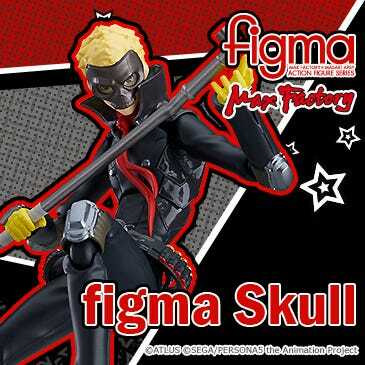 Of course, you can also come up with your very own original poses for her! 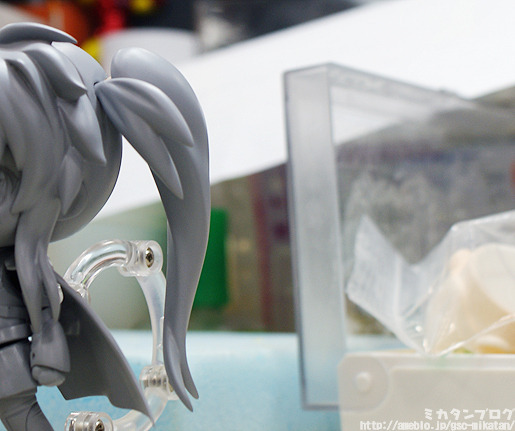 Her body isn’t the only thing that is fully posable – even her cape can be moved around to the left and right! You can pose it completely spread out for some really dynamic poses! Other small things like the black ribbon in her hair or small little ankle joints can also be moved around, allowing you to craft amazingly customized poses! You can’t have Fate without her trusty intelligent device, Bardiche! 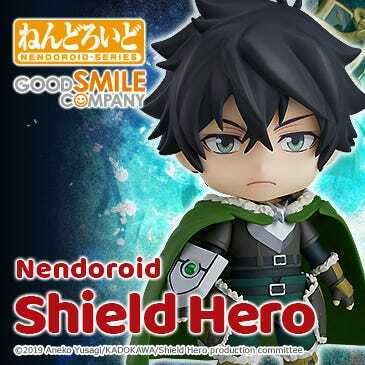 The previously released normal Nendoroid Fate came with Bardiche in Axe form and Scythe form, so this time he was included in Zanber Form instead! But weapons aside, isn’t she just adorable?! 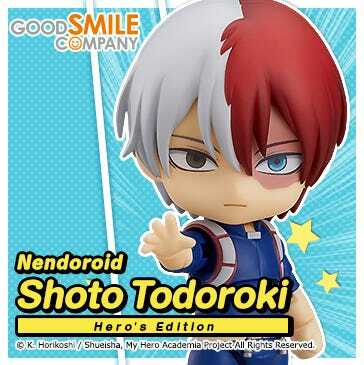 The Nendoroid size really creates such a cute and unique balance! A pose for the shouting expression! This is my attempt at a mid-air pose! It came out quite nicely, if I do say so myself! This pose actually has her upper body in the reverse direction of her lower body, but that made quite a nice dynamic pose! 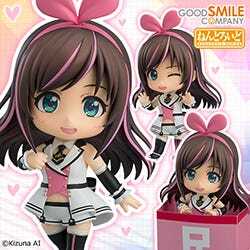 Making your very own poses like this is really one of the best things about fully posable Nendoroids! What a peaceful expression… it makes me feel all relaxed just by looking at it! Fate-chan is so cute!! The cape can be removed too… I’m really not sure how I’d want to display her! She looks great in so many different poses! I’ve been focusing on the posability, but another thing to notice is the different outfit used in the movie version of the series – the sculpting and paintwork are all so detailed! Just look at the belt buckle or the triangle at the tip of the shoes – they are simply outstanding! 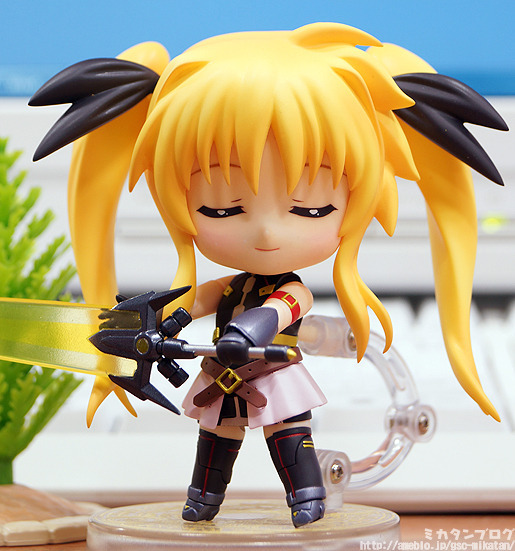 Many of the parts and expressions of Nendoroid Nanoha Takamachi : Exelion Mode Edition had been sent off to China, but I managed to pull together enough parts to pose her together with Fate! 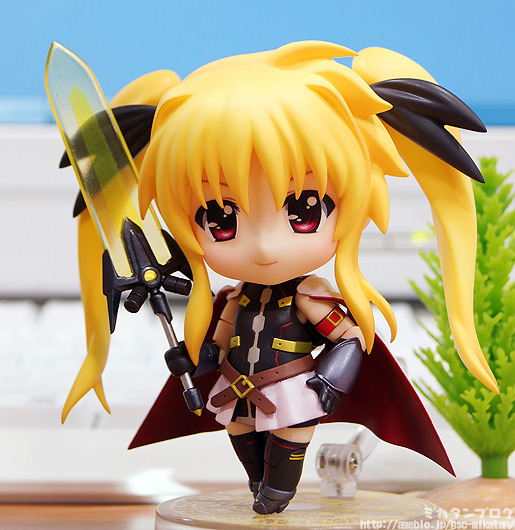 As was announced awhile back, Nanoha’s releasd date has unfortunately been delayed until December – apologies to anyone who was looking forward to getting her this month! She’ll be ready shortly, so please be patient just a little while longer! 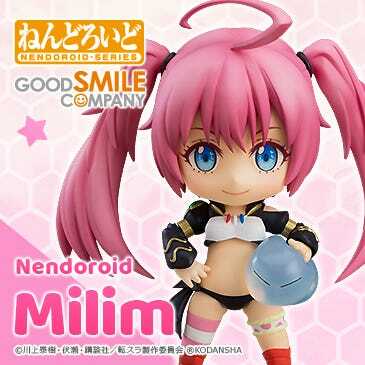 She’ll be up for preorder from the 29th November! It’s still quite far in the future, so don’t forget about her!